If you have all these, you're ready to begin. Unbox the package you received. The power adapter is rated for a power input of 100-120V. Do not use the power adapter if the electricity at the wall socket is of higher voltage. Contact Norton Support for assistance. Choose a location near your broadband connection and place the Norton Core router on an open shelf, table, or TV stand. For the best wireless signal, make sure that there are no obstructions where you place the Norton Core router. If you find any physical damage to the device or any of the components, contact Norton Support for a replacement. Turn on Bluetooth on your mobile device. The Norton Core router uses Bluetooth (BLE) to connect with the Norton Core app during setup. Tap Set Up Norton Core. Read the license agreement, and tap Agree & Launch. In the Select your current wireless set up screen, select your current broadband set up. Follow the on-screen instructions to physically connect Norton Core router with your current modem or modem and router combo device, and power them on. You should wait for about one minute after you power on the modem/modem and router combo device and Norton Core router. Norton Core router displays a blinking white light to signal it is ready. Wait for a few minutes as Norton Core performs a sequence of configuration tasks that include establishing and securing a connection, and installing the latest updates. Tap Next on the prompt to sign in to your Norton account. Provide your Norton account email address and password, and tap Sign In. Tap Next after your Norton Core is linked to your Norton account and activated. In the Let's create your secure network screen, enter a network name and password for your wireless network. 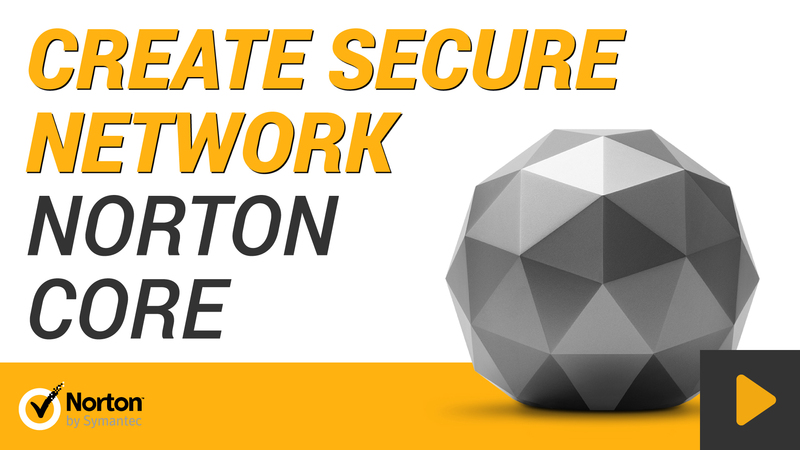 Norton Core creates your secure wireless network and displays the Congratulations screen. You have successfully set up your protected network. Norton Core displays your Norton Core Security Plus subscription details and then the home screen. The Norton Core router light changes to solid white. You are ready to add all of your household devices to your new secure network.